“One of the rarest and most interesting IWC watches of the last few decades . . .” -Jack Forster. I’m sorry to begin with some one else’s opinion, but I don’t think I could have created a synopsis any more succinct than Mr. Forster’s. The true ceramic zirconium fliegerchronograph has become an icon for IWC and is a testament to their innovation. So what’s so special about the limited 3705? The model was their first full ZrO2 Keramik (ceramic to you and I) chronograph. The resulting case is ultra-light and hard enough to effectively never scratch. The svelte and legible three-register pilot dial is finished in tritium, a coating which has yellowed remarkably evenly on most examples. The cream achieved here is simply gorgeous; no fauxtina here. The 3705 is powered by a Valjoux 7750, modified by IWC and Richard Habring. They tuned positions and isochronism as well as many reliability and accuracy tests on each movement. The case back, crown, and pushers were pieces too small and delicate to be forged in zirconium, so left steel. It’s a contrast some hate, but I love. The 3705 was introduced in 1994 in a run under 2000 examples. It was released together with the steel 3706 and available at 50% premium. The run was so small, however, that many collectors aren’t aware this piece even exists. The extremely functional design of the steel version saw huge success. The 3705-3706 pair really set the aesthetic for all of IWC’s current pilot range. It can especially be seen as a father to the top guns and miramars of the world (love or hate them). However, at a full 7mm smaller than their modern pilot’s chronograph, this generation a more subtle and perhaps more tasteful choice. This example is an A+ by any measure. The dial and markers have faded together to a light yellow cream. The sapphire crystal is original and unmarked. The zirconium case is unscratched, you will not be surprised to hear. The unpolished steel case back sports some light scratches, but nothing offensive. It comes on the brown leather Hodinkee strap pictured, with the original croc band and buckle. It has full box and papers, although they’re in worse nick than the watch. This 3705 was originally sold in Australia, and the boxes have clearly seen their fair share of sunshine. The watch, however, is pretty near perfect. It’s a reference forgotten by most except the cult following who adore it. Values have been strongly increasing at auction and private sales for the last decade. 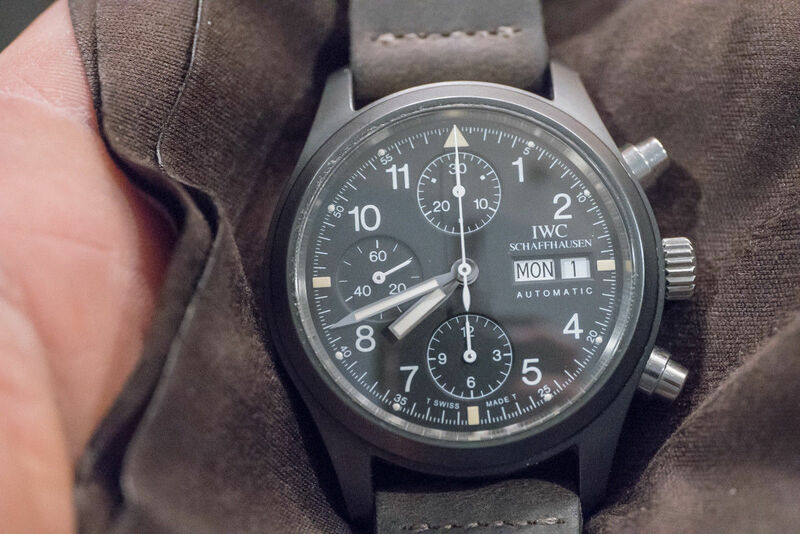 It’s the one I most adore out of all of IWC’s modern range, big pilots and all. Clearly some others agree with me. The hunt has become increasingly difficult in the past years for the 3705. With such a small production run, it’s not hard to see why. For those who have waited, here’s the chance. Find it on auction here (sold) with no reserve.